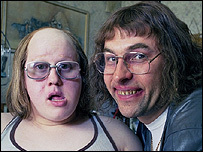 Little Britain stars Matt Lucas and David Walliams are to appear in an episode of Neighbours. The duo appear as Lou and Andy in the episode which has already been filmed in Australia. Their cameo roles will be screened in Australia in three months' time, but UK viewers will have to wait until it is broadcast on BBC One later in the year. The official Neighbours website said their visit to the soap was "relatively kerfuffle free". "The cast and crew were delighted to welcome Matt, David and the documentary team that are recording their experience on tour Down Under," it said. The scene features Andy and Lou in the Scarlet Bar with Neighbours favourites Steph and Toadie, played by Carla Bonner and Ryan Moloney. Lucas and Walliams are the latest famous faces to make an appearance on Neighbours. Last year Australian cricket legend Shane Warne popped up on Ramsay Street, while Australian Idol host Andrew G also turned up unexpectedly in the fictional suburb of Erinsborough.